Prototype: Mitsui Rail Capital Europe electric locomotive, road number 91 80 6193 876-0. Built by Siemens as a regular production locomotive from the Vectron type program. 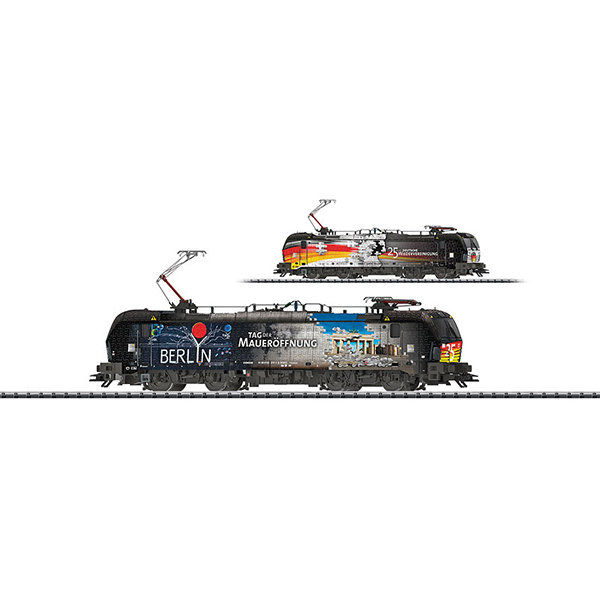 Model: The electric locomotive is constructed of metal, has an mfx/DCC digital decoder, and extensive sound functions. It also has a special motor, centrally mounted. 4 axles powered be means of cardan shafts. Traction tires. The locomotive has triple headlights and dual red marker lights that will work in conventional operation and that can be controlled digitally. The headlights at Locomotive End 2 and 1 can be turned off separately in digital operation. When the headlights at both ends are turned off, then the "Double 'A' Light" function is on at both ends. The engine room lighting can be controlled digitally. The cab lighting can also be controlled digitally. Maintenance-free warm white and red LEDs are used for the lighting. 2 mechanically working (not connected for catenary power) pantographs. Length over the buffers 21.8 cm / 8-9/16". Highlights: Specially designed packaging. Both locomotive sides imprinted differently from each other. This model can be found in an AC version in the Marklin Start up assortment under item number 36194. Digital locomotives or digital device for the Märklin Digital System (Motorola format).